The WinPad 10. Tecno’s first Windows Device. Several more Windows devices are in the Tecno product pipeline. the growth of enterprises that use ICT to improve productivity. It is only logical that company that is attuned to the African ICT “heartbeat” such as Tecno, recognized this need and is adjusting their strategy to add value in this market segment by including Windows based devices. Please read on for the interview with Mr. Huang. Q: Tecno has a good strategy on your android devices where you cover a wide range of devices with very competitive specs and prices compared to your competitors. 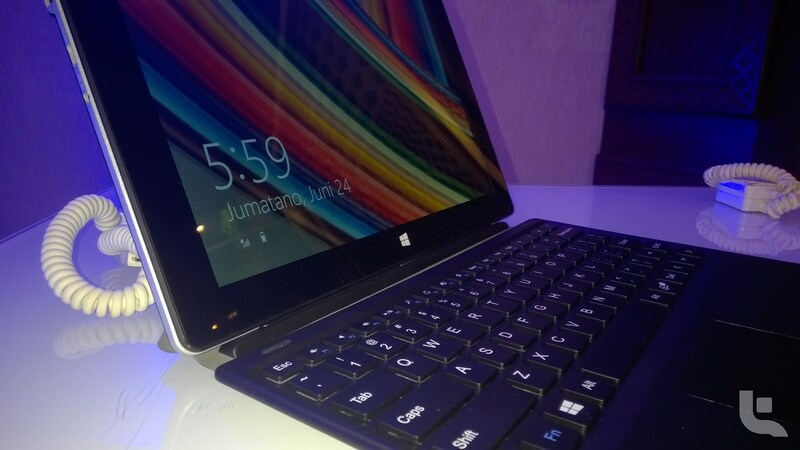 What is Tecno’s plan to take this strategy to the Windows Market? A: To come back to the PC strategy of the tablet business. So basically we have 3 categories. The first category we call the DROIPAD. The major product for Dar E Pack is entertainment. So we include both Windows and Android operating systems. The devices range from 6”, 7, 8” to 10” screen size. All these products will come with 3G and 4G connectivity. The next category that we are developing right now is WINPAD. The feature for this class will be productivity. Basically we are looking at 2-in-1 devices, plus a low cost notebook. The 2-in-1 devices that we are developing range from 8.9”, 10.1”, 11.6” and 12”1. The key difference between Tecno and other multinational companies is that we develop our products oriented for the African market. So for example, one journalist today raised a very important question about charging.2 The next generation products that we are developing, we are suing high density batteries that can support 12 hours battery life as well as support very fast charging technology. We are working to bring this technology in the tablet devices. It is important to understand that the supply of power (electricity) is always a challenge in African countries. Maybe not so much in Kenya, but in many West African countries they have big issue with the power supply. We also adding a lot of innovation in our camera technology with dual flash, rear flash and front flash. Besides this, all our devices will be built with 3G and 4G connectivity, we don’t sell Wi-Fi devices. All these features support the core focus of Tecno being oriented towards the African market. The third category that we are looking at will be for Education. We are developing educations solutions for Kindergarten (Age 5-6), middle school students (primary school) right through High School and even Note Book for University students. We are also developing laptops for the teachers as well interactive front panel very similar to the Surface Hub. Q: Similar size to the Surface Hub? A: Yes, 84 inch, with 2K and 4K touch enabled displays powered by Intel Core i5 and i7 processors, and also including remote conferencing features. This interactive panel will be for both education and enterprise organizations. This device will be much more cost effective than the Surface hub. Q: When you look at the Kenyan market, what do you have in mind with regard to the KES 17 billion that has been budgeted by the Kenyan Government for ICT in education for the past 3 years? A: We see a tremendous opportunity for education tenders in the African market, including Kenya. In Kenya there’s the “One Child One Laptop” program by the government. So we will look at two opportunities for direction in the education business. One is that we will participated in the education tenders organized by the government and by the schools. Beside that we will also look at the consumer market because we a lot of demand from the parents who want to buy laptops or tablets for their children, but they cannot find the right devices in the open market. The advantage of Tecno is our well-known brand, we very good at selling though our channels and we have a good service network. This will enable us to sell these education devices in the open market. So for those parents who would like to buy the product for their kids, they can buy them from our shops and sales channels. Q: With Windows 10 being launched on July 29th, can you provide a time frame of when we would see the next range of Windows Devices from Tecno? A: The (upgrade) program organized by Microsoft “Buy 1, get 10 free”. That means if you buy a Windows 8.1 device, you will get Windows 10 free. For the launch today, the consumers will be able to upgrade for free to Windows 10 in August. The devices to be launched in Kenya in Q3 and Q4, will come with Windows 10 pre-installed. Q: Do you plan on starting any assembly of your devices in Kenya in the near future? A: Actually we have some prior experience on assembling devices in Kenya. We have already started our preparations with selecting land, so when the conditions become mature we can easily set up. Since 2012, we have 2 factories in Ethiopia, with another under construction. So we have a lot of experience with assembly (in the region) so this will not be a challenge. Q: Which devices would plan on bringing to Kenya for Assembly? Laptops or Mobile devices (phones)? A: I think we will look at the Education devices because of the recent requirements and from the speech we heard today from PS of ICT3. He mentioned an education tender required by the government that will need local assembly. Q: All of your smartphones are passed on the Android platform. Are you looking at producing some smartphones on the Windows platform in the future? A: Actually we are in deep discussions with Microsoft. We will start from phablet and tablets first, though I think that anything is possible. In an earlier discussion at the event, Mr Huang confirmed that this 12” devices will come with the next generation Intel Skylake processor. This remarkable as laptops that designated for distribution in Kenya are often one generation behind when it comes to processors. The question pertained to how long it took to fully charge the WinPad 10. Mr Joseph Tiampati Ole Musuni, the Principal Secretary from the Ministry of Information, Communication and Technology.